to 16 expert coaches at your fingertips sharing their success tips and how they help others to follow the path of their dreams. 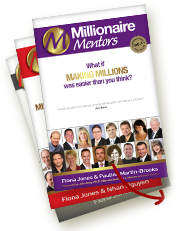 I love The Millionaire books because they are full of inspiring stories of ordinary people achieving extraordinary results. Opening your mind to new possibilities for yourself, creating new behaviours, actions and results." "What I enjoy about the Millionaire books is being able to read any chapter in any order depending what appeals to me first. Having a busy lifestyle this style of reading is great. I also really enjoy the access to the money maker gifts at the end of each chapter that give me access to a lot of great content and information that I can use in my business and personal development. Everyone successful says having a coach is a great way to achieve your dreams. 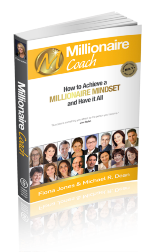 I feel I have a 100 coaches at my fingertips thanks to the Millionaire Book series. " "The Millionaire books are great! I have read five of them and find the content educational and inspiring and the stories help keep me motivated and on track toward my goals. I like knowing the journey others have taken to live their dreams and gain an insight into the steps it takes. Everyone talks about having a coach or a mentor andhere in one book are 16 coaches sharing their tips and hints that I can implement now. " Are you living the life you’ve dreamed of? Imagine being able to make just one decision that could transform your entire life. And if by making that decision, your life immediately started heading in the direction you’ve always dreamed of. Would you jump in feet first? You’ll also find out how as a mother of four children and successful businesswoman Samantha still has energy at the end of the day! and international coach Michael Yacoub reveals all! ​ Why it’s important to love what you do! If you want to transform your life now and get what you want, or you simply want to make a few positive changes, you MUST read this book! Coaches. All designed to transform your life and business.